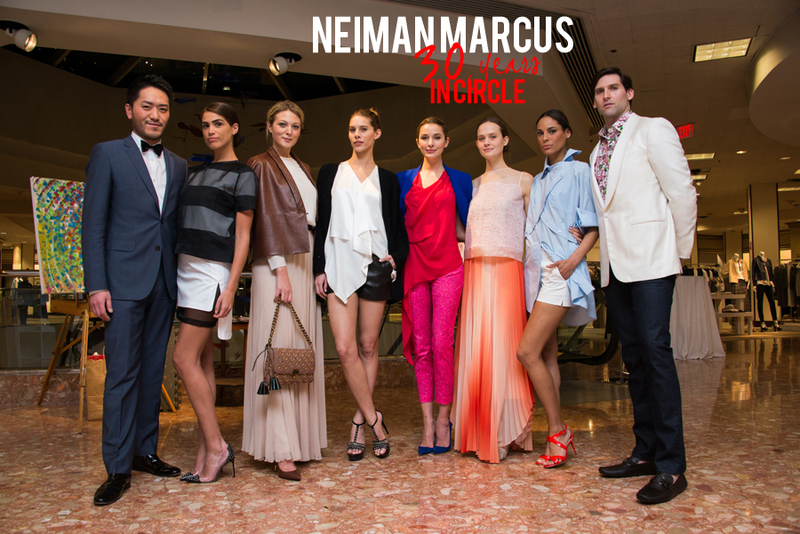 Neiman Marcus recently celebrated the 30th Anniversary of its InCircle loyalty program with an evening of fashion, cocktails and LIVE art by local artist Amy Kaufman. Amy wowed the crowd with the artful strokes of her brush, while cocktails were served in this season's favorite color: pink. Neiman Marcus Style Advisor Dave Chen styled twenty-eight looks in a Spring and Summer fashion presentation featuring all of the trends for this season. Of course, no Neiman Marcus extravaganza is complete without delectable treats! Thanks to East Meets West Catering and Georgetown Cupcake, Spring continued right onto the plates! Music beats provided by the talented Scott Arrington of Murray Hill Talent. It's always an honor to photograph a designer and Tabitha Simmons, Vogue contributing editor, shoe designer and British Fashion Award winner, was especially lovely at Saks Fifth Avenue, Boston. Very gracious, warm and approachable. I loved that while she was meeting fans, mingling and signing her fabulous Bonais or Haydens she was also taking iPhone photos to Instagram later! The atmosphere had a bit of British influence with beats spun by ESC Music Design/Mario Papathanasiou and a sumptious afternoon tea catered by Capers Catering. Neiman Marcus is synonymous with luxury. The fineries of fashion, designer trends on the cusp, not to mention the fancifulness of giving. The 2013-2014 collection of jewelry designer Elizabeth Locke, whose pieces are handmade in 19K gold, reflect the classic, historic, vibrant colors of a time past, yet designed for the modern day woman. The influence of the arts of centuries before us are seen in luscious Venetian glass intaglios, intricately carved gambling pendants, Greek and Roman relief coin pieces finished in hammered gold, all exuding the precious quality of timeless heirlooms. As a photographer I am always seeking to capture the beauty in everything and the grand opening for the newly remodeled designer floor at Saks Fifth Avenue was exactly that: beautiful. The ribbon cutting ceremony was hosted by VP General Manager Gretchen Pace and Marketing Director Cara Fratto, who unveiled the myriad of luxury boutiques including Donna Karan, Alexander McQueen, Alaïa, Stella McCartney, Pucci, Givenchy, Céline, to name but a few. Each of the luxury brand's aesthetics are reflected in the unique layout, lighting and interior design of each shop. Exquiste materials, some imported from Italy, are showstoppers themselves, notably the pink inlaid wood floor (designed by Stella McCartney herself), the luminescent onyx wall from the team at Céline, and the baroque moulding at Alexander McQueen. Donna Karan herself raved about the newly designed floor when she was in town for the launch of her own in-store boutique. I had the honor of meeting and photographing the iconic Donna Karan, thanks to commissioned coverage for Saks Fifth Avenue, this Fall. I was delighted to cover the opening reception party for her luxurious designer shop in the newly remodeled space for modern and contemporary fashion. 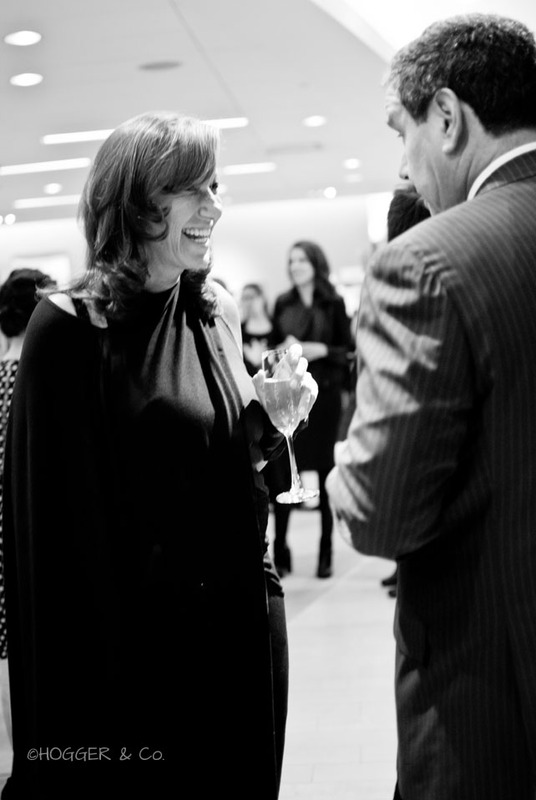 In grand company, Ms. Karan was welcomed by Stephen Sadove, CEO of Saks Fifth Avenue, Gretchen Pace, VP General Manager, Jennifer De Winter, VP of Stores at Saks Fifth Avenue as well as other friends and guests. To me, Donna Karan has always represented the modern woman; the strong woman. Her Fall 2013 collection is no different. Built upon her first stand-out collection of seven easy pieces and also influenced by her late husband Stephan Weiss' sculptures, the pieces are sensual and sculptural, working together by addition or subtraction. Being at an Alice + Olivia NYFW presentation is like being in a candy store: everything is colorful, sweet, pretty and you want it all! I'm so glad I was able to make the SS2014 show at the Highline in my 6 hours at fashion week this season. As always, it was such a beautiful collection: preppy, girly and OH SO pretty. The theme of the Marlon Gobel collection is the "cowboys of the sky", the ironworkers of the 20s where this type of work brought brave young men from Europe and Canada to New York, the capital of skyscrapers, to "build this city". Documented by photographer Lewis Hine in his series "men at work" he showcases men laboring on iron beams up in the air, for the construction of the Empire State building in 1930. Such is the inspiration behind Marlon Gobel's Spring/Summer collection, and what better location to show than at NYC's Park Avenue Armory under an ironwork canopy? I was in NYC for less than 24 hours for Fashion Week this season, covering four shows in six hours. Pamella Roland's SS2014 show began with lots of inspiration from the Cannes Film Festival in the 60s..lots of bold, vibrant and French Riviera colors: orange, pink, yellow with a bit of metallics and neutral black and ivory. The honeycomb beading was a stand out as was a stellar transparent vinyl trench coat...functional, yet fashionable. The highlight for me was sitting behind THE Nigel Barker, and thanks to D Dipasupil/Getty Images there's this. And if that wasn't awesome enough, Jay Manuel was also there. Neiman Marcus continued the Fall Trend Party (see part I, here) partnering up with Fashion Project for a fall fashion presentation by Andy Tabulina featuring gorgeous Maggie Models in all the trendy looks for the season: red as the new neutral, mini structured bags, and a little bit of borrowing from the boys. There were couture cupcakes from Georgetown Cupcakes to be decorated with all the fall trends... I mean, who doesn't love a studded cupcake? I especially loved meeting my friend Elizabeth's daughters who stopped by, and hanging out with the lovely ladies of the Fashion Project who gave away "do-goody" bags and spoke about their wonderful company. Aug 15 Boston: Neiman Marcus, TRENDS for Fall! I don't know about you, but I'm ready for fall! Especially if RED is the new neutral! Come join me as I photograph the opening night of the Neiman Marcus Fall Trend Event, where everything from rocker chic to a bit of tomboy, to the pointed toe (yes, it's back!) to scaled-down handbags, and red as the new neutral are coming at you this season! Classics like black, navy and animal print aren't going anywhere. As for jewelry, try layering lots of chain-link necklaces and studded pieces. I love that the moto jacket is here to stay, too. Neiman Marcus personal stylist Elisha Daniels gives a fashion presentation sharing the latest trends for the season, and it's all fabulous! I was born in the 70s....um...that's the LATE 70s, but have always been a fan of the 70s boho chic look. Especially all of the colors and patterns of that decade, so when I was invited to check out the new Hippie Chic exhibit at the MFA, I brought Anathalia along for the "trip". Meeting Rebecca Minkoff at Nordstrom for #RMRoadtrip was a.... trip! Add meeting blogger Clare from C Squared W in real life with her friend Kristen? Perfection. It made for a wonderful time in Chicago...and I bought this for my sister, which Rebecca signed. Mar 25 Boston: Neiman Marcus, AnaMaria Pimental for SPRING!